The pro-Forms® Mobile app enables field workers to collect data on the move even without a data connection. Quickly build mobile forms by drag & drop and choose how the data is presented and shared with others. Plan, raise & allocate jobs directly to field worker mobile devices. 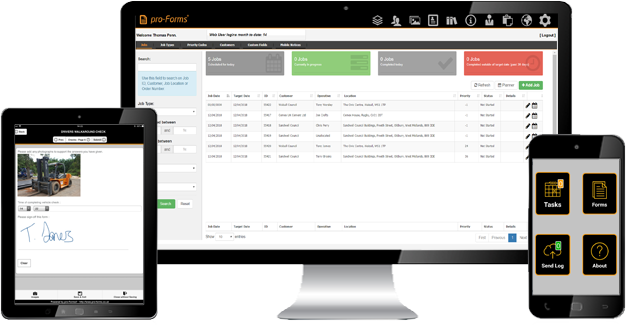 Pre-populate forms with customer and job information to improve efficiency. Locate and map field staff and job statuses. Our online forms are the ideal tools for completing browser based forms on desktops, laptops & mobiles. Effortlessly build forms to match existing documents via a simple drag & drop interface. Use our pro-Connector® app along with bespoke APIs to seamlessly integrate collected data with your existing office systems such as Sage50 Accounts and maximise your efficiency.